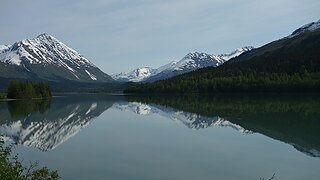 In May of 2016, my friend Sarah from Colorado joined me on a long but awesome drive up to Alaska and along the way we climbed a number of peaks and saw so much beautiful scenery as we made our way through British Columbia and the Yukon from Seattle. 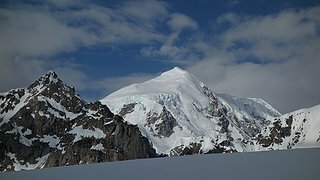 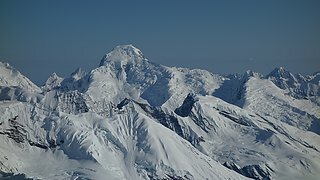 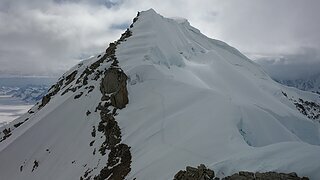 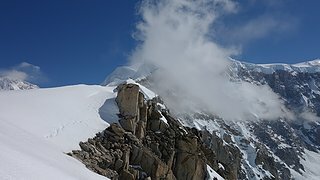 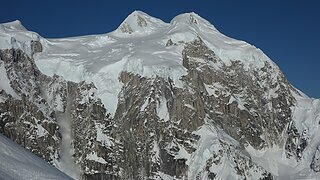 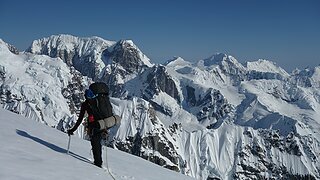 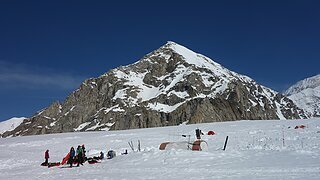 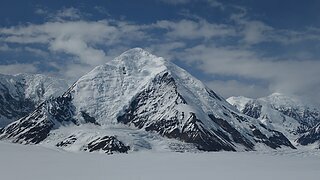 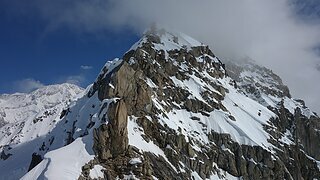 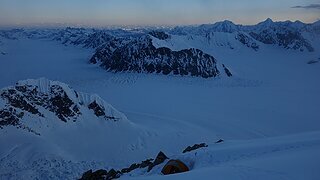 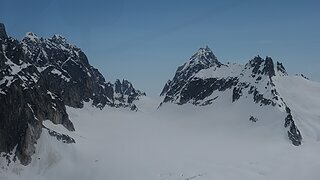 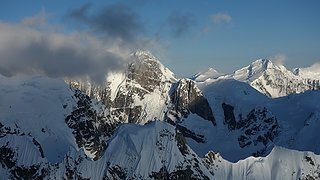 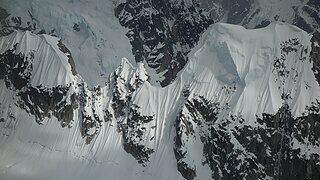 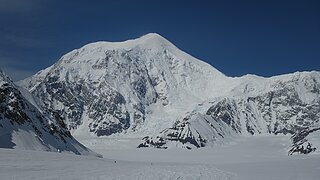 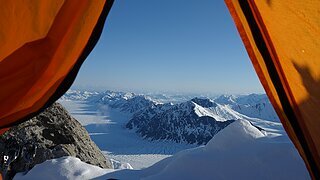 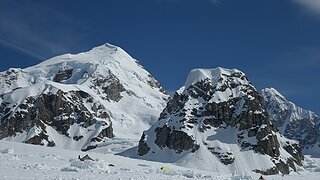 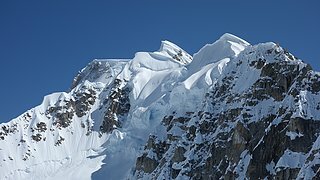 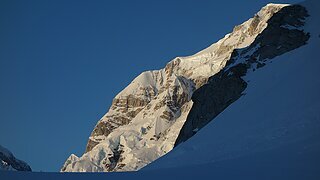 The main objective for the trip was the West Ridge of Mount Hunter, which we would decide when to fly into base camp at the last minute when we got a good weather forecast. 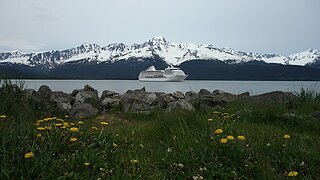 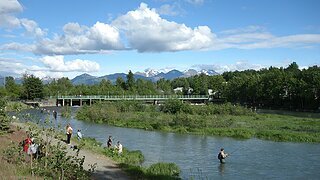 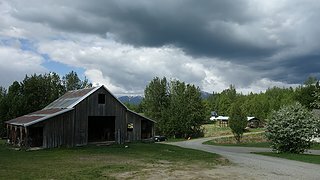 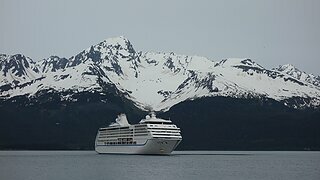 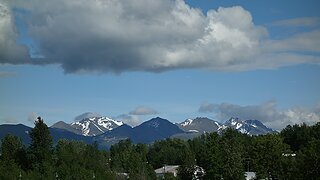 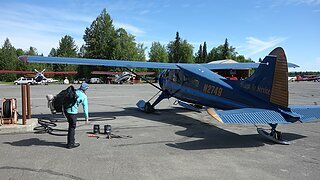 Upon arriving in Alaska, we didn't have much good weather so we waited a number of days in Anchorage and explored the Chugach Mountains a little, until late May, we drove up to Talkeetna and began the long process of packing up our gear and going through the car (which was full to the brim with stuff). 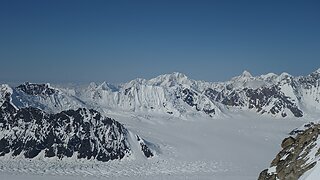 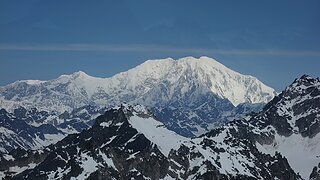 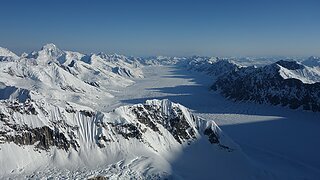 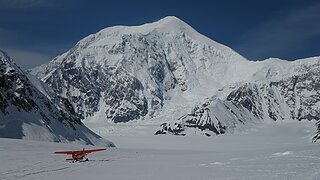 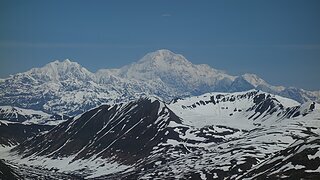 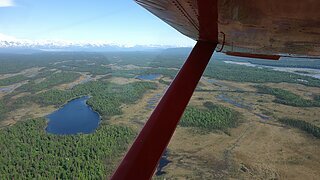 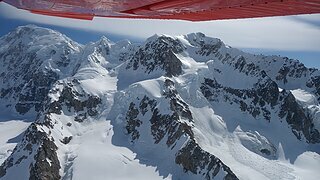 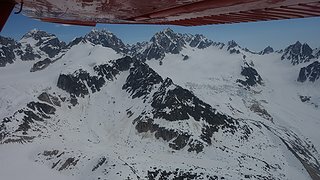 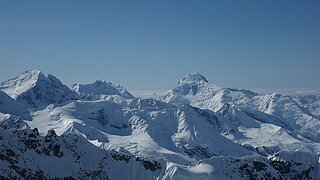 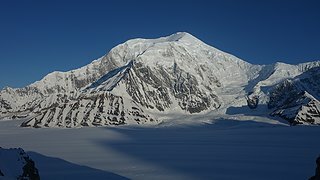 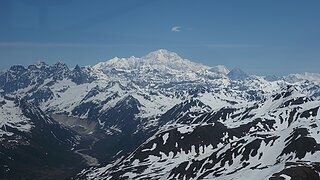 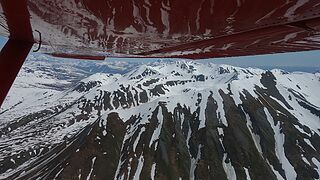 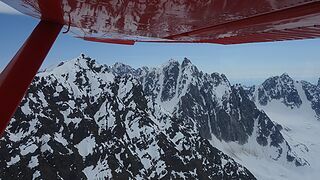 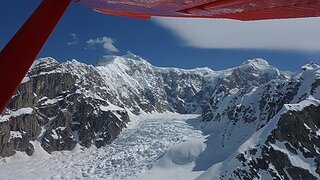 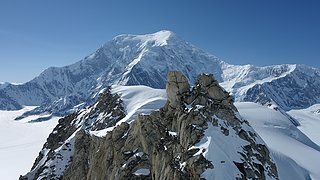 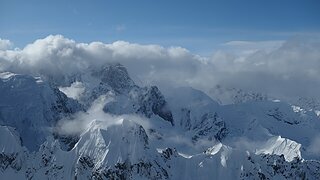 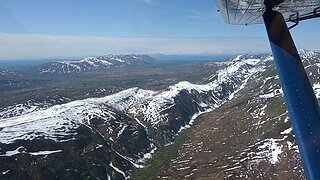 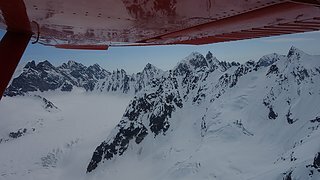 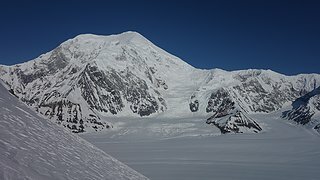 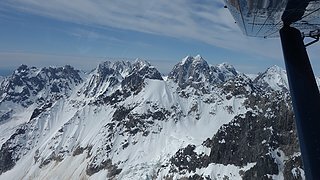 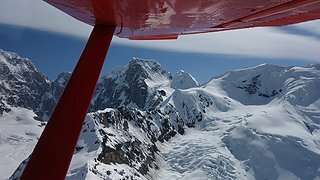 We flew to Denali Base Camp with Sheldon Air Service, which was the original pioneers in flight service into the Alaska Range, and offer the best and cheapest service to base camp, geared more towards climbers than the other two options in Talkeetna. 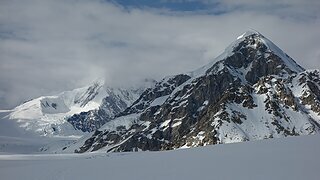 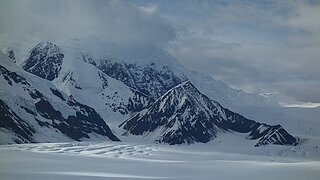 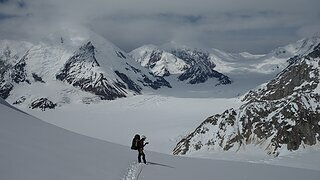 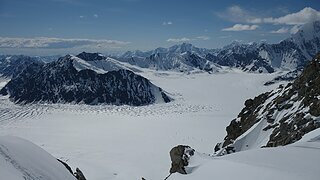 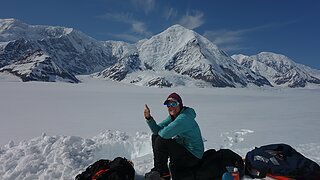 We landed on the snow covered Kahiltna Glacier midday and didn't waste any time packing our gear in the sleds and starting the hike to the base of the west ridge. 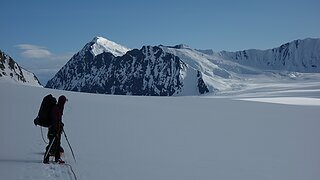 It was a beautiful sunny day and we picked a great camp spot right at the base of the route, and spotted some fairly fresh tracks heading up the opening basin. 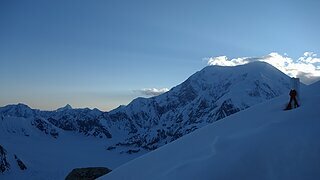 After burying our gear stash, we cooked a serious dinner and decided it was best to get to bed early, but at 11pm I peeked out the tent and saw a vibrant glow on the north face of Hunter as the sun was just about to set off to the north. 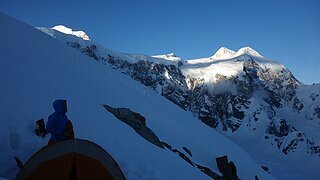 The next morning we started hiking up the initial basin, following a set of tracks up to the cats ears, which post the first major obstacle on the route. 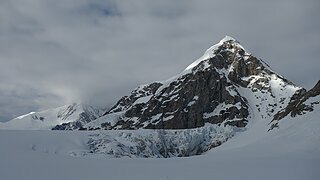 Hiking along the flat plateau through deep snow to the cats ears was a brutal slog, and upon reaching this feature, we had to hesitate and find the correct route down to the notch below us. 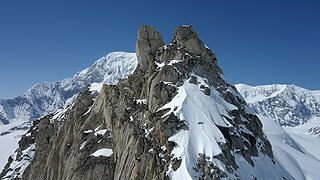 I finally found the rappel anchor by scrambling through between the two rock towers. 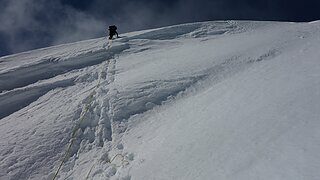 So we made one double rope rappel which brought us to easy snow slopes leading down the rest of the way to the saddle. 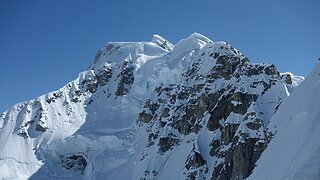 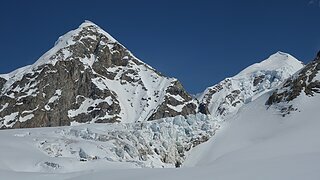 Looking up the other side, I see what looks like two pitches of AI3+ alpine ice. 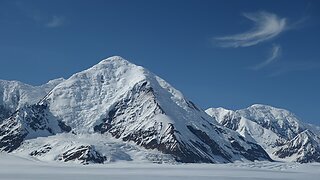 I prepare to lead and make it a full 60 meters up the 60 degree ice and make a two screw anchor. 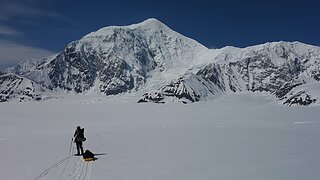 I then haul my stupidly heavy pack up as I didn't want to lead with it, and I begin to realize if I will have to haul my pack around everywhere, we will not be making it to the summit. 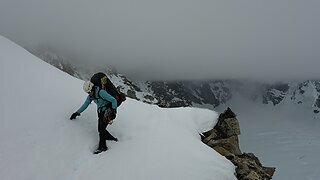 I was carrying over 50 pounds and so was Sarah, and somehow I knew right when we put packs on starting out that we would not likely make it carrying so much. 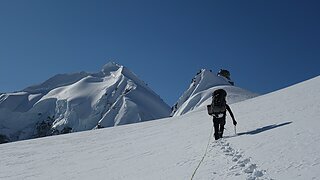 Either way, I expended tons of energy dragging my pack up the ice, then belayed Sarah up. 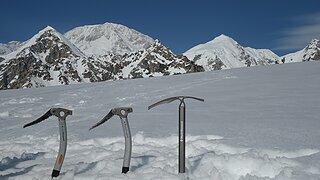 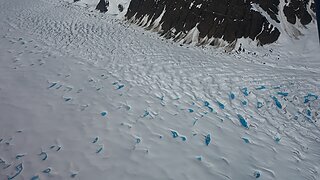 I repeated this process leading the second pitch until I made it above the ice and reached snow once again where I could make a good picket anchor. 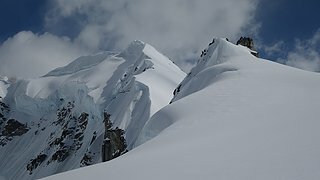 We then continued to hike on steep snow to the top of an unnamed peak, and just as we started down the other side, we came a cross a 15 foot vertical drop in the ridge I was not expecting. 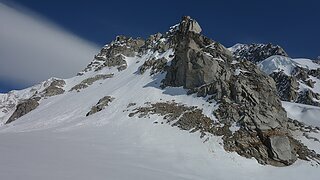 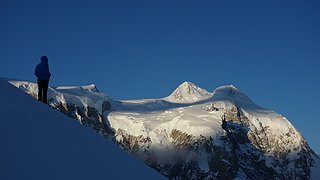 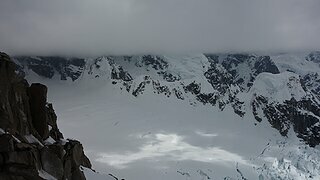 It was a large cornice made up of loose, dry powdery snow. 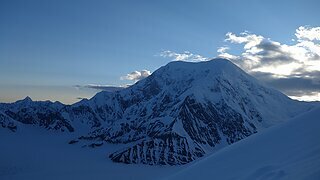 It was getting fairly late so we decided to return to near the summit and dig a tent platform just below the summit of this peak. 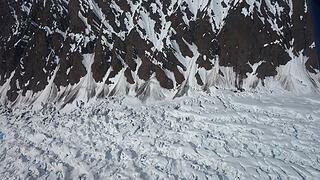 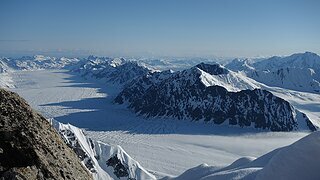 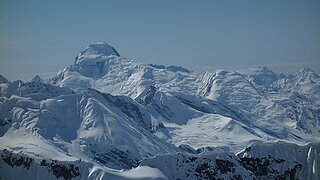 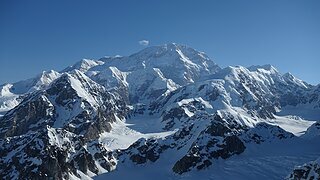 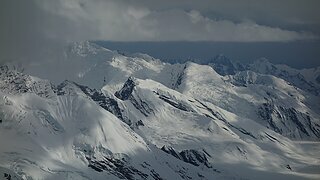 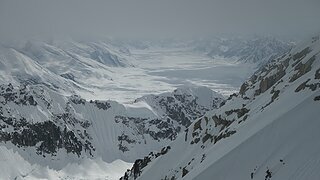 From the top we could see base camp below us to the north and most of the major Alaska Range Peaks. 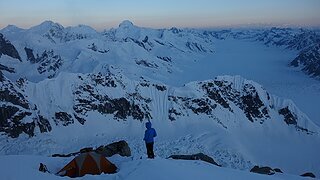 From our tent we had a spectacular view to the south with Avalanche Spire dominating the view. 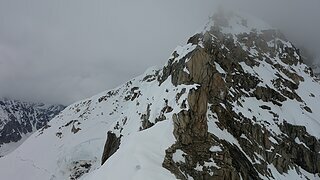 The Ramen Couloir below us to the east was also partially visible. 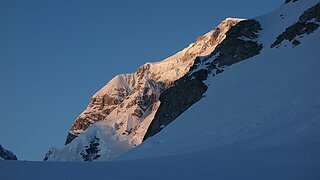 We made a quick dinner, and just as the sun was low on the horizon we hit the hay. 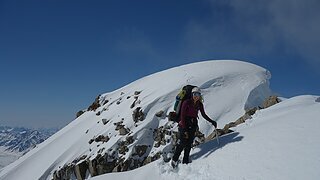 Sarah and I talked it over and we decided we would make another gear stash here to try and lower our pack weight, and try to continue and push on. 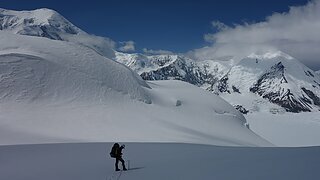 I ditched somewhere between 5-10 pounds worth of stuff and early the next morning, we started down to the next saddle. 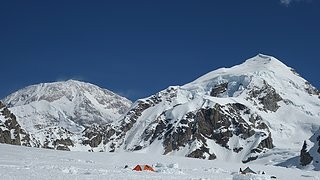 I was able to make a solid picket anchor for the 15 foot drop just beyond our camp and we could rappel down to easy terrain once again. 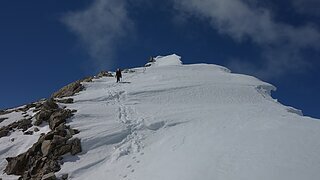 We descended a few hundred feet and found ourselves at the beginning of the mixed climbing section. 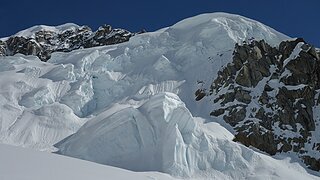 Looking up at nearly 800 feet of snow covered loose rock didn't look too fun, especially since I was still carrying over 40 pounds. 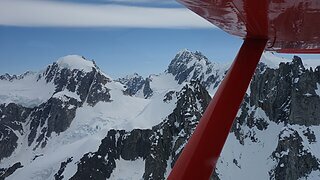 I traversed right onto a ledge to bypass the initial cliffs, then we roped up for me to lead a steep snow slope with huge cliffs below, followed by a 20 foot vertical step in mixed ice and rock. 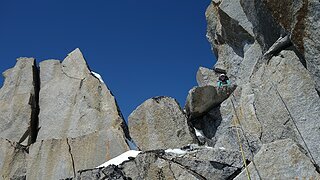 I reached a nice belay ledge with a bunch of slings and belayed Sarah. 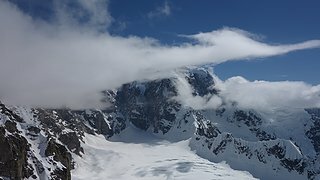 By this point I noticed clouds building fast, and my back was in pain from the weight. 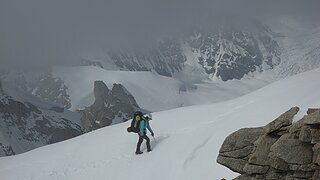 Sarah and I convened on the ledge and looked at the very old fixed line ahead of us. 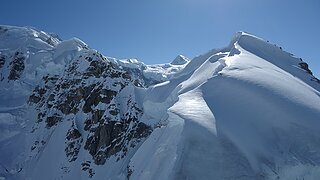 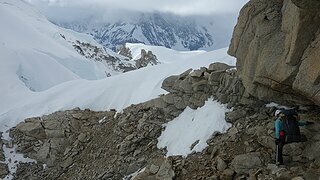 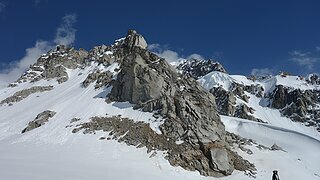 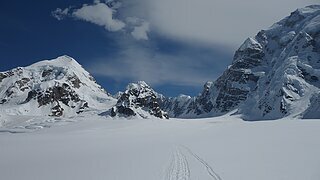 A very exposed traverse across a series of small ledges covered in snow awaited us. 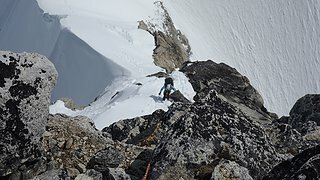 I started scrambling across, but with so much weight I was off balance to the point I didn't even feel comfortable continuing. 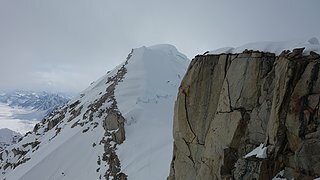 It was an easy 4th class section but a fall would have been certain death, and I wasn't going to risk it knowing I was so unstable, plus, the rocks were very loose. 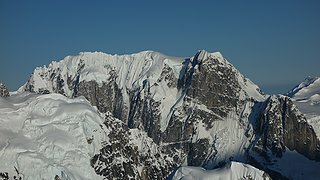 The fixed line was a joke and not worth using either. 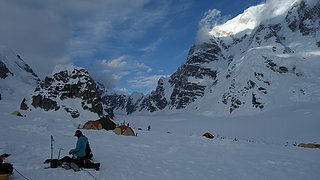 We decided to turn around and return to the same camp. 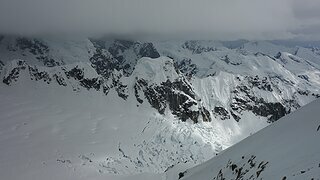 It was about 2pm and it began to snow, but I made sure to get a good look at the remainder of the rock band above us, and it really didn't look fun at all. 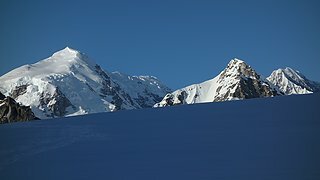 Maybe if there was either more snow, or none on the rocks it would be better. 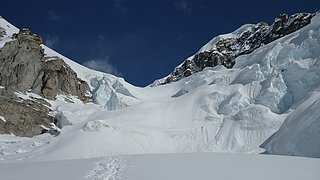 Our traverse back to the tent pad went smooth, apart from the vertical step where I had to basically swim straight up through very loose snow. 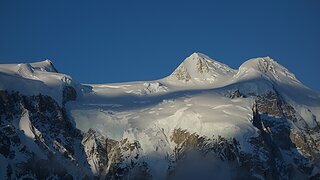 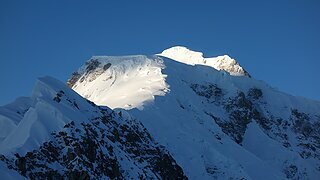 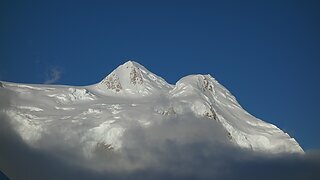 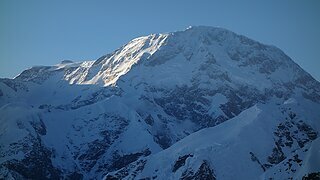 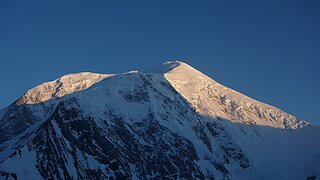 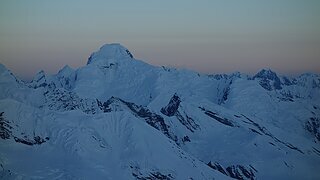 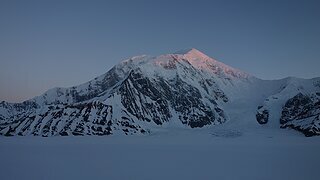 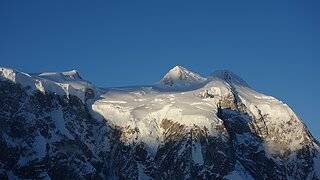 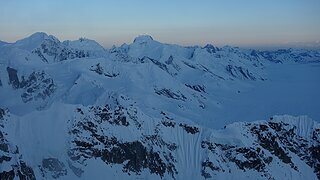 We enjoyed a beautiful evening with the late afternoon sun hitting the summit of Hunter, well off to our east. 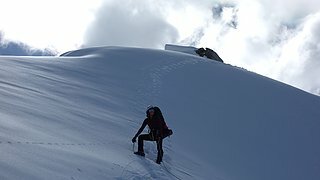 I reflected on how many different things went wrong for us, and everything came back to the excessive amount of gear we were carrying. 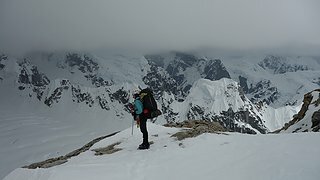 I had the energy, the weather was good, and without the pack, I would have easily felt comfortable on everything I saw ahead of us. 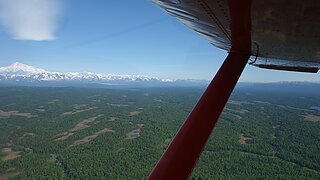 So I made it a point from that point forward to fully partake in the ultralight movement. 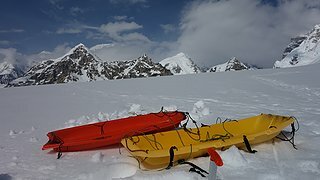 This failure was solely a result of gear mismanagement and not bringing the correct gear, and bringing many extra stuff we didn't need. 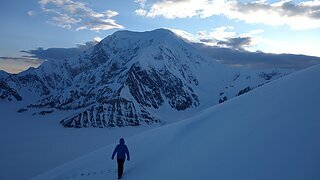 Anyway, the next morning it was considerably colder, and the surface of the snow was actually crusty. 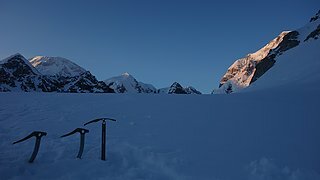 We got back to the top of the two pitches of ice and made two double rope rappels, the first off a picket and the second from a V-thread. 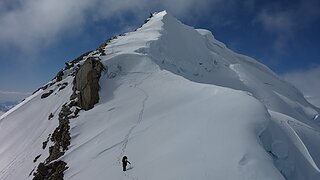 Then we both solo climbed the ascent back to the cats ears, which had a couple 5.4 moves but was not too difficult. 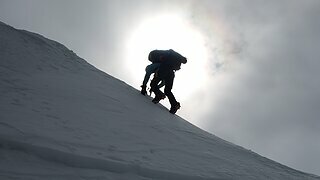 Then we made the slog back down to base camp. 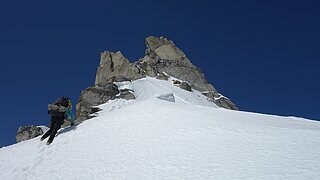 Feeling dejected I was ready to fly back out, knowing my gear would not suffice for any climbing here, and I was already thinking of ways I could lighten my load, since I had a serious Peru trip coming up, and some lofty goals in the North Cascades I was looking at doing. 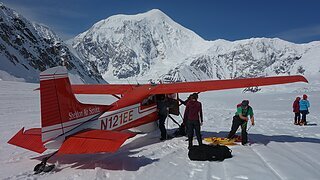 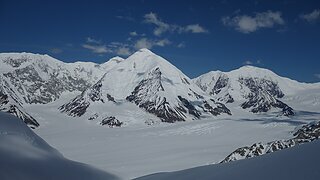 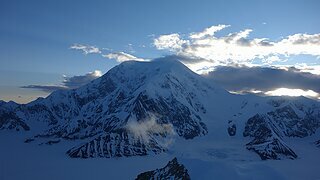 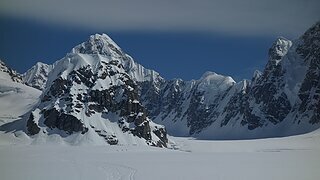 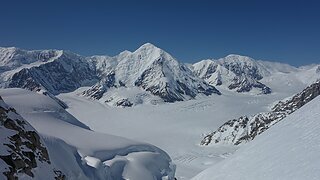 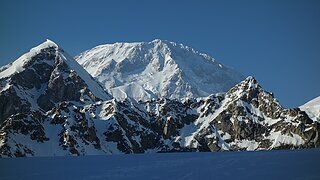 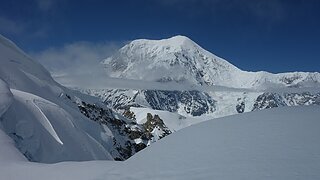 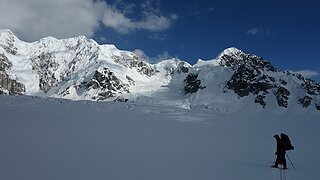 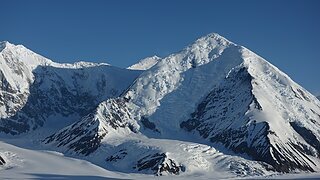 We quickly loaded the sleds and hiked back to Denali base camp, up Heartbreak Hill. 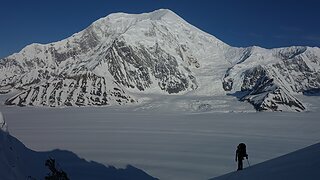 We set up camp among a few dozen other people and called for a ride back the next morning. 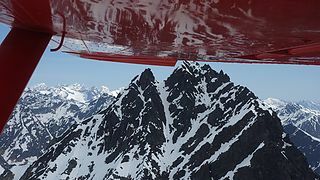 I reflected on the flight out and looked at potential future goals from the air, but knew I would be back for revenge on this mountain. 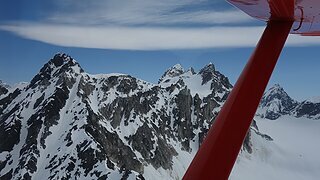 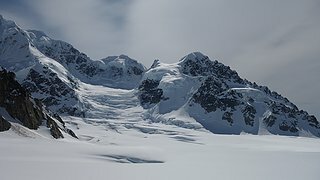 It was my second visit to the Alaska Range, and my second failure, however the world class scenery we witnessed along the way more than made the trip worth it, and I knew I had so much more to look forward to for the summer of 2016.